Big Max Pumpkin | Henry Field's Seed & Nursery Co. Handsome pumpkins, up to 100 lbs. or more, make excellent pies and impressive jack-o'-lanterns. Fine-grained, bright orange flesh is great for canning or freezing. 110 DAYS. Spacing: 4 - 5 seeds to a hill, hills 6 feet apart. Soil Requirements: Rich, well-drained and fertilized soil. Pruning: Lightly cultivate or mulch to reduce weeds. 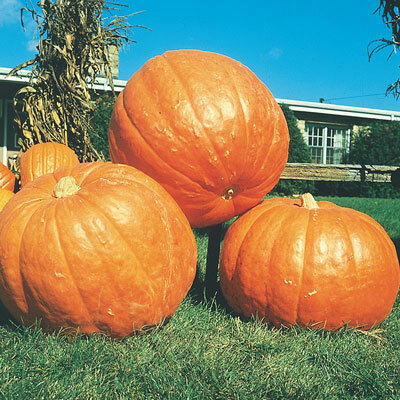 Size: Squash-type pumpkins that grow up to 100 pounds or more. Fruit: Red-orange skin and thick, bright orange flesh.